Remember that time when I drew a comic about teeth and talked about how uncomfortable it made me? 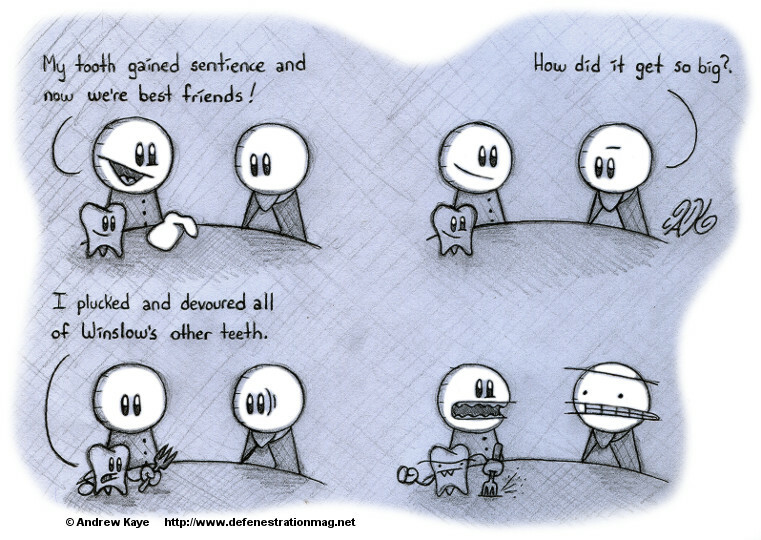 Well, apparently the discomfort wasn’t enough to dissuade me from drawing a second comic about teeth. This is like a stress dream and a nightmare rolled up into one, but with a nice sprinkling of friendship. Andrew Kaye (known in some circles as AK) is the creator of Ben & Winslow and other questionable comics, many of which can be found in his deviantART gallery and his Tumblr. He’s also the editor-in-chief of this magazine.